I refuse to use the ‘H’ word but here is a post about the bits I bought in my recent order from Cherry Culture. It was my first ever order and all went really well – delivery took about two weeks (not bad when coming from America and I chose the cheapest delivery option) all packaged nice and secure, nothing was damaged when it arrived. All items were present and correct and I’m looking forward to having a play with them. All in all the order cost about £35 including delivery and factoring in exchange rate. There were no customs charges when I collected the package either. Below is the full list of what I chose, it’s not a massive order (the prices are v.cheap) as wanted to see how it all went before I went a bit overboard! NYX Nail Polish Purple Ave.
Not sure what to start playing with first! I love Cherry culture! 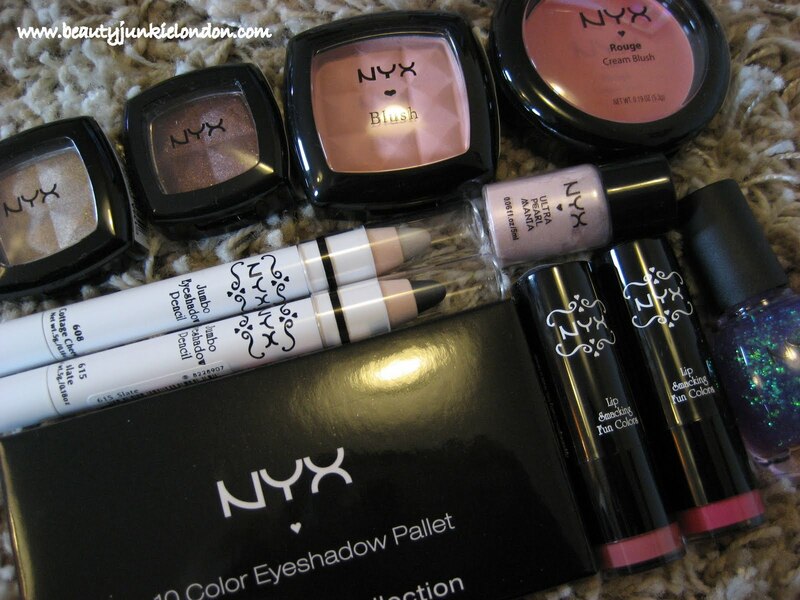 They often have special offers like 25%off NYX stuff!so I order from them all the time! I love the lipsticks you chose I have them and adore them so creamy! They are really good value – most bits only around $2 and the most expensive thing was the palette which was $8 I think (the creme blush was $6) and delivery wasn’t too bad – about $12. Bargain! All the bits you’ve bought look really nice & for such a good price. That’s a huge haul for £35 incl delivery! Can’t wait to see all the pics etc. This is so not going to do anything to lessen my make-up obsession hehehee. Wow, great things you bought 🙂 Looking forward to see your experiments with them! I’ve wanted to order from Cherry Culture for a while now – I hope I get as lucky dodging customs charges! Have you seen the NYX counter in Harrods? Ooooh, look at all the goodies!! 🙂 Nice “h”! Hahaha. Are you planning on using Cottage Cheese as an eyeshadow base? I keep hearing it’s great for that but I’ve never tried it. I would definitely be playing with the runway palette! I have often heard american beauty gurus mention cherryculture – glad to see their shipping was good!